With COMEXIO you get an enormously powerful and affordable solution for building automation. Say goodbye to standalone solutions and set on a system-wide Concept for blinds, heating, lighting and more. Through the interaction of various functions such as temperature control, shading and lighting, you do not just have a real added value compared to a conventional installation, but also to each isolated solution. Comexio is the only system that met all our needs at a reasonable price! Whether simple lamp or light scene, adjust the lighting to your mood! Leave the temperature control confidently COMEXIO! We will not let you sit in the cold! With COMEXIO you have your consumption firmly in mind! Visualize without limits! Whether tiled surface, or any image, free design is guaranteed with COMEXIO! 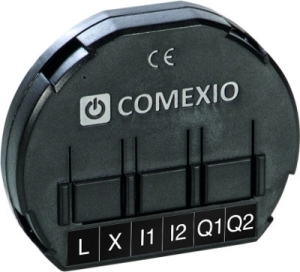 COMEXIO controls your shutters and blinds not only on button! Take calendar functions and more to make your life easier! Alarm functions at no extra cost! Secure your home by motion detectors and window contacts you use anyway to control! Your SmartHome helps active in many daily tasks. Because the possibilities of Comexio are almost unlimited, here are only the most important and most frequently used applications presented. Reduce your heating costs with COMEXIO. If a window is open, the heating is turned down. This is also ideal for use with your alarm. As soon as a window is opened in your absence, the alarm is set off. COMEXIO lets you know via email. Find out if your washing machine has finished or your iron has accidentally been left on. 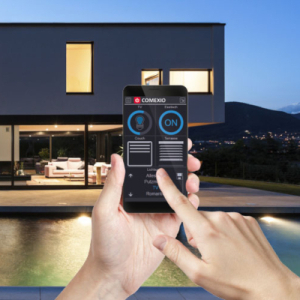 With the integrated COMEXIO consumption measurement, you can monitor and control all desired electrical devices. COMEXIO makes sure the temperature is comfortable for you in every room. In your absence, the temperature will be lowered to reduce heating costs. Your home will be waiting for you when you come home from work with the temperature adjusted to your optimal level when you arrive. Open and close your automatic shades in accordance with your wishes. For example, they open at sunrise and close at sunset. 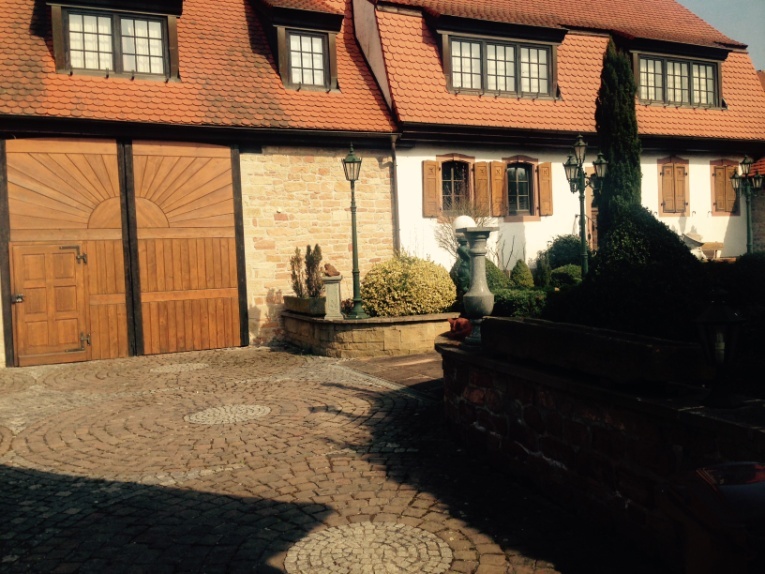 Use solar energy to heat your home in winter and fully-automatically protect your home from overheating in summer. 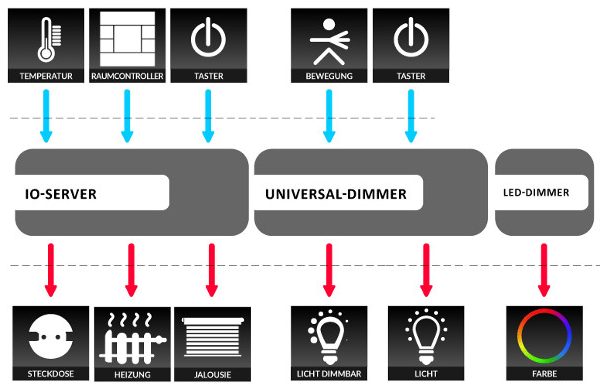 With COMEXIO, control plug sockets to incorporate lamps, etc. into light scenes. 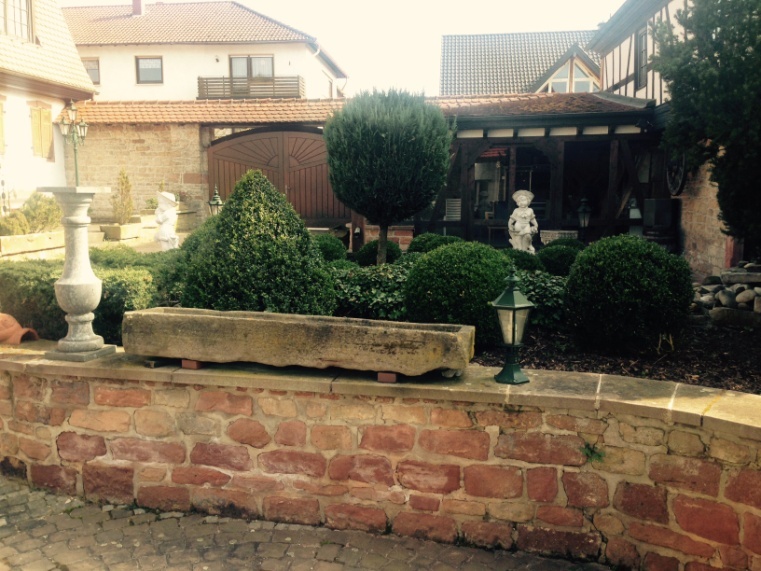 Put your garden in the limelight with brightness and time-dependent automated control. Use COMEXIO to automatically water your garden. Supply the water depending on the temperature and weather conditions. You can of course water your garden while on holiday using your smartphone. not only automatically turn lights on or off, they also provide safety. Use them in your absence to complete your alarm system. Select from several light scenes to make your living room appear in the perfect light. For example, selecting the TV scene will turn off all lamps reflecting in the TV and the remaining lights are dimmed. All scenes can be individually created and changed. 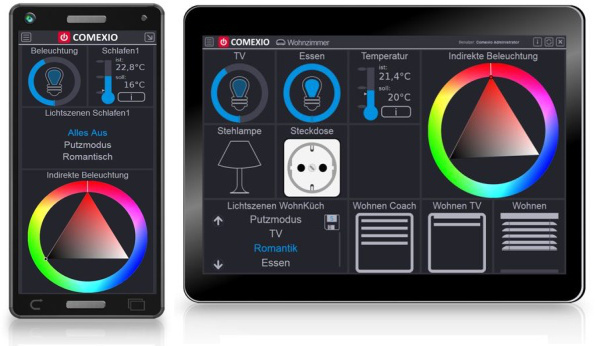 Using your tablet, you can operate all your controls, such as lighting, heating, shutters, blinds and much more, even on the move. Use your fire alarm to light up your home in a fire and open all shutters and blinds. Switch off all lighting and any necessary electronic devices when leaving your home. Your heating will automatically lower and the alarm system will activate. Your home will look after itself. Presence simulations can also be turned on for long absences. Garage door still open? Check the status of your garage door at any time with your smartphone or tablet or even on the move. Soon you can install Comexio also in existing buildings. We will inform you when the time comes.